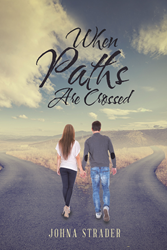 Recent release “When Paths Are Crossed” from Page Publishing author Johna Strader is a perplexing tale about two individuals caught in a web of complicated circumstances of love, passion, and sacrifices. Johna Strader, a poet, overnight cashier, call center assurance manager, firearms manufacturer office manager, marketing director, and hearing assistive technology consultant, to name a few, has completed her new book “When Paths Are Crossed”: a captivating story of Shayna and Trey’s challenging love affair that quickly grew into something serious and unexpected, convoluted by their own personal problems and caprices. Published by New York City-based Page Publishing, Johna Strader’s engrossing narrative reminds that there are always two sides in a coin, each having a personal struggle in life, all being a happenstance of fate’s design. Yet, despite this, some instances and roadblocks prove to be the ones that define one’s self and puts everything into perspective. Readers who wish to experience this enthralling work can purchase “When Paths Are Crossed” at bookstores everywhere, or online at the Apple iTunes store, Amazon, Google Play, Kobo, or Barnes and Noble.